It's a fact. Aeration is one of the best things you can do for your lawn. Compacted soil and heavy thatch are the two biggest obstacles to a beautiful lawn. They tend to suffocate grass plants by preventing air, water and nutrients from reaching the root zone. This means your lawn looks less than satisfactory in spite of adequate fertilization, water and tender loving care! Aeration opens up the thatch and helps relieve compaction. It should be a regular part of your annual lawn maintenance program. Aeration is accomplished through the use of a machine equipped with cylinder-like tines designed to penetrate and shatter the soil. Cores of thatch, soil and grass are actually pulled out of the ground during the process. The plunging action of the tines opens up the soil, allows grass plants to breathe, permits better utilization of fertilizer, air and water and promotes a deeper, healthier root system. Which ever method you use, oxygen and water can now enter the soil because of aeration. Rainwater will not run off. Earthworms and other beneficial organisms have room to live. Fertilizer can reach the grass roots. Healthier grass means fewer weeds. Self-propelled units, lawn tractor attachments, and hand or foot-powered plugging tools are available for aeration. Whichever tool you use, aerate your lawn in the same pattern as you would when mowing. Afterwards, rake to remove plugs or wait for them to dissolve naturally. If you want, top dress with compost or peat moss to further enrich the soil. You can also apply seed and fertilizer after aerating. Lawn aeration strengthens the roots, and strong roots equal a lush, green lawn. Aerating once or twice a year will generally do. With a lawn aerator, lawn aeration can be an easy do-it-yourself project, but any good lawn care provider can aerate for you as well. Tip #1: Use a lawn aerator that pulls out plugs of soil, not one that uses spikes. You might imagine that spikes make holes that allow water and nutrients to reach your lawn's roots just like any other lawn aerator. Since the spikes don't take any soil out with them, however, they often contribute to the very soil compaction problem they are trying to solve. Tip #2: Water your lawn the night before you plan to aerate. This will ensure that your soil is nice and soft. Working a lawn aerator through dry, hard earth can be a challenge. Tip #3: Aerate the highest traffic parts of your lawn most frequently. Heavy foot traffic can make soil practically impermeable, and lawn aeration can go a long way to solving high-traffic-area problems like slow growth and low resistance to wear and tear. Lawn aeration can make particularly weak lawns vulnerable to weeds, though, so consider applying an herbicide at the same time you aerate. Tip #4: When you're done, remove the plugs. Chances are you've walked by a recently aerated lawn and wondered who let the dogs out. Spare yourself any sidelong glances from the neighbors. Simply gather up the plugs or mow over them with your lawn mower to break them up. *This service starts at $100 and the price depends on the size, condition and materials used. 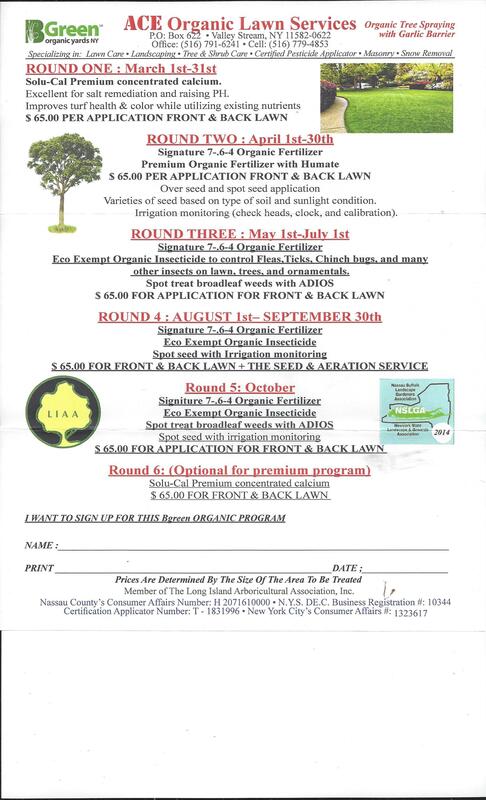 The lawn area includes the service, fertilization and seeding [$4.00 per lbs]. There will be an extra charge if peat moss, granulated lime, top soil and any other material is used. This service will assure and guarantee a greener and thicker lawn.